MAG Ireland reports that its high viz survey has drawn a fantastic response. MAG Ireland say, “We are truly grateful to everyone who took part and in so doing helped to shine a light on this contentious issue. We were particularly impressed with the number and quality of the comments left by those who took part. At the time of writing, there are just under 400 comments all told out of just over 800 responses in total. While the specific survey questions were relatively straightforward, the real eye opener for us was in in the depth and quality of the comments. They’re so good we simply had to take a representative sample to post in order to try and reflect the depth of feeling around this issue. With almost 400 comments running to more than 26,000 words it’ll be difficult to do it justice, but we’ll try. We have read every single comment submitted so far. To try and put some sort of context on this we’ve done a few read throughs and grouped some comments together. As you might expect, there are some strong views not only regarding compulsion, but also both for and against high-viz itself. If someone is not actively looking out for motorcyclists then it doesn’t matter if you wrap them in neon lights, they still won’t see them. I don’t believe hi-vis vests have any effect as people who don’t look won’t see you no matter what you wear. I don’t believe hi-viz should be mandatory. Recommended, yes. But making yourself more visible won’t help in the majority of accidents where drivers don’t LOOK – if they don’t look, it doesn’t matter what you’re wearing. I’ve been wearing hi-viz gear on and off for a few years now and find that it’s not that people don’t see me coming, it’s that they don’t look, because they are distracted e.g., on the phone, at their radio, doing their make-up etc. As thousands of us know from direct personal experience, some drivers will simply pull out on you, or change lanes on top of you, or turn across your path without looking. So many of you reported accidents or near misses of this type that we’re going to run a study on this very topic early in 2012. I use a Hi Vis most of the time but I think it should NOT be compulsory to wear Hi Vis jackets or vests. While I do choose to wear hi-vis clothing most of the time I do not think it should be made compulsory, it should be down to rider choice. Whilst the use of Hi-Viz vests may provide some benefits, it should be a choice the rider makes. I hope that hi viz wearing does not become mandatory as I would rather have the choice even though I wear it at all times anyway. If mandatory wearing of a high viz jacket improves the road fatality figures, then bring it on. Some people aren’t capable of making the decision when it is vital to wear one so the decision needs to be made for them. Seatbelts in cars were once left up to the driver as to when it should be worn, we know the results of that, and now that they’re compulsory, the number of horrific injuries have been reduced. In my opinion , a his viz jacket’s effect is negligible compared the headlights being on. Most car drivers can’t even see a headlight. All the bikes i ride are fully faired so on a head on view a high vis won’t be noticed. Riding my motorbike with dipped headlights, in my opinion is sufficient enough for other road users of my presence on the road. The first thing any body will see is the motorbike headlight not a hi viz. The headlight on my motorcycle is permanently on, plus all of my regular motorcycle clothing (Jacket, over-trousers, gloves & boots) carries discreet scotchlight piping which is highly effective at night. 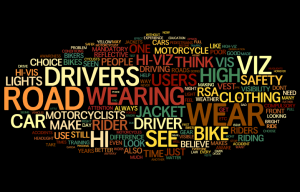 If a car driver cannot see all of that then he simply is not looking for motorcyclists. Having your headlight on and wearing a highviz cancels out the highviz, whats the point….? Improved DRIVER training is a much better option. Fix the problem properly don’t just stick on a sticking plaster. Instead of putting the problem of car drivers poor observation on the shoulders of us bikers in the form of MANDATORY Hi-Viz, the RSA should put more emphasis on proper car driver training. Leave the decision up to the rider. The authorities should be more pro-active about rider visibility in car driver training – too many car/van/lorry drivers don’t give a second glance for motorcycles. Hi Vis is a useful tool but the real threat to m/cs is poor driving by other road users. I believe that the RSA should concentrate their efforts on improving driver training and education instead of further regulation of motorcyclists riding gear. Treat the cause, not the symptom. RSA needs to consider the real issue which is the other road users not looking for bikes and shrugging their shoulders when they hit us. The only possible chance we have is if your average car / van / taxi driver is trained to be more aware of hazards on our roads including but not limited to motorcyclists. Some respondents raised questions around the insurance situation, and how blame might be apportioned in the event of an accident if the legislation comes to pass. If I do wear Hi viz and still get T boned, what is the position regarding suing the RSA? There is also the possibility that insurance companies may decide not to pay out on any accidents in the event of the rider not wearing hi-viz. Finally, there is also a social aspect to this whole issue, something which a few of the participants picked up on. We think of ourselves as a community in many ways, albeit one with distinct sub-cultures, so these insights are important. It is a cultural thing, in as many ways that a head dress is symbolic to a religion then the wearing of black patches cut offs etc are our lifestyle choice and is a reflection on our way of life and belief system. The imposition of any form of compulsory clothing segregates a group in a community and and removes freedom of expression and with the Christian Motorcycle impinges on their right to express their faith. As a member of a Back Patch MC, I don’t wear hi viz as it would contravene our Club Rules on the wearing of Colours aside from the fact that as a discerning adult I feel its a choice issue. We in MAG Ireland believe that most of the problems we face as riders stem from the dysfunctional thinking that bikes are a “problem” to which some magic “solution” must be found. Proposals like the mandatory high-viz idea are a direct result of such dysfunctional thinking. Unless and until all the agencies involved in transport planning start to see bikes in a positive way, we’ll continue to see pointless and divisive proposals such as this one. MAG Ireland acknowledges the positive work the RSA has done such as supporting our call for a reduction in the VAT rate on motorcycle PPE, and we now call on the RSA in turn to acknowledge the damage that this one proposal has done to their credibility and standing within the motorcycling community. We’ll be publishing the full results of our high-viz survey in the coming weeks. On behalf of the wider motorcycling community, MAG Ireland extends our sincere thanks to all of you who took part. We had a recent incident where a group of riders on the road craft assesment portion of their licence test, all wearing flouro had a driver run up their backsides. Claimed he did not see them……..
MAG Ireland is delighted to release the preliminary results of our high visibility usage survey. The responses show some interesting trends. MAG Ireland will continue to push for the mandatory high visibility proposal to be dropped from the National Motorcycle Safety Action Plan as mandated by our members. MAG Ireland is not, and never has been, opposed to high visibility clothing. We say simply, “Let the Rider Decide”.